Birds are always inspiring and painting birds is one of my hobbies. As much as I love bird watching I enjoy painting them as well. Tried 3 major different surface for my bird paintings. Canvas, wood and the most challenging glass. "The Nature Guide of Birds" and "Birds Encyclopedia" are my best handy book to learn about each bird that I decide to paint. My very 1st bird painting The Willow Goldfinch also known as American Goldfinch/ Wild Canery is an oil on Canvas. The bright cadmium yellow Willow Goldfinch with its black cap, cone-shaped bill, white patterned wings and white rump is most likely to be a male. As the female's plumage is more muted with olive-green body and dark brown tail. Though I was very much interested in birds, was unsure of its strokes and the right effect to make it look natural. Hence visited the local library for some help to self-learn the art of painting birds. The daisies and the fence added more beauty looking natural, but I purposefully removed the details for the bird to get all the attention in this particular painting. Realized painting birds was just a piece of cake if observed keenly to understand the layers of hues and chose the right brush strokes for each effect to appear near realistic and presentable. 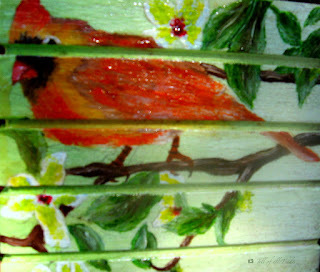 My next set of bird paintings were on a wooden Birdhouse. 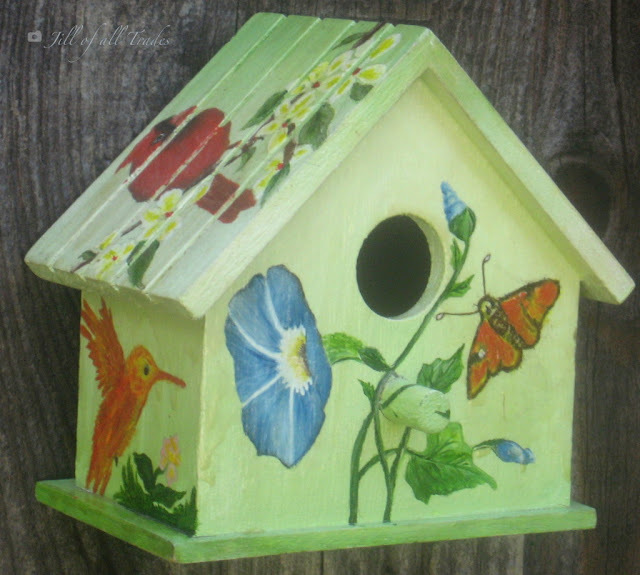 All the 5 sides including the roof of the birdhouse was painted with different kinds of Birds (such as Cardinal, Humming bird and Sparrow), Butterflies, flowers like Morning glory vines and some radiant cherries to go along. I throughly enjoyed painting this birdhouse as I didn't required any guidance. Sorry I couldn't do justice with this birdhouse picture, just found these casual photos as the bird house is no more with me. The most challenging of all bird paintings was The Bluebird on window sill. Songwriters has adapted this elegant Bluebird as a symbol of happiness. I was eager to try something new and chose to paint on glass. As some of you already know, glass painting is always done with reverse steps. All the highlighting and detailing goes first. Had to take notes of the necessary steps ahead of time to proceed gradually from last to first step. Most importantly I had to guess the proportion and the right placement of each detailing. This short and brightly colored Bluebird is elegant with its royal blue upper body and head, along with beige breast and white belly has slender beaks with short legs. Broken glass effect on glass and the web was the highlight apart from the Bluebird. Do these birds look realistic? Vote your favorite and don't forget to let me know in the comments below to improve on my upcoming projects or a few words of encouragement will be appreciated. Enjoy bird watching!